Owner altered window and facade details to gain Landmarks approval . 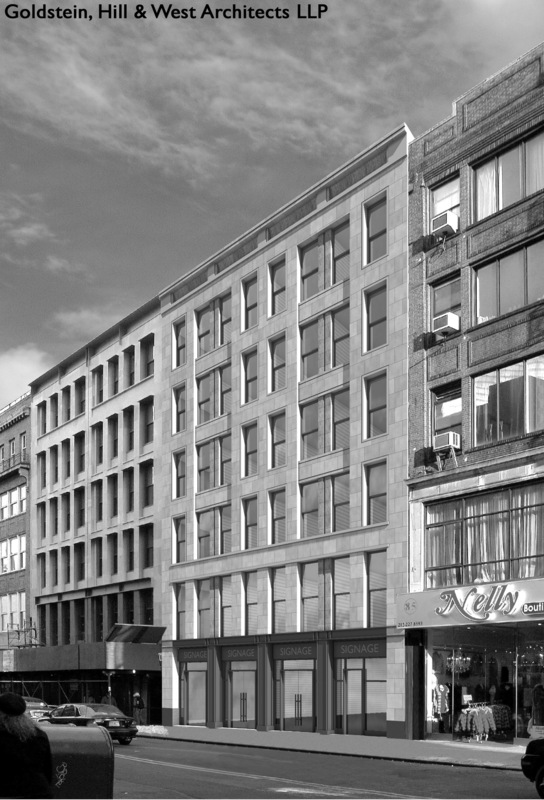 On April 12, 2011, Landmarks approved Fishman Holdings’ revised proposal to construct an eight-story building on a vacant lot at 87 Chambers Street in the Tribeca South Historic District. The through-block building will front Reade Street to the north. The lot had been occupied by a store-and-loft building that Fishman originally planned to convert to a hotel. The building, however, partially collapsed in 2009 and Buildings ordered Fishman to demolish the remaining structure. Fishman in February 2009 presented a plan to build a hotel that closely followed its conversion proposal. The building would rise six stories, with two additional floors set back fifteen feet. Landmarks approved of the building’s massing and scale, but asked for changes to the facade and window details. 8 CityLand 29 (March 15, 2011). In April, Greenberg Traurig attorney Jay Segal informed Landmarks that Fishman changed the building’s proposed use from a hotel to residences. Even though the new proposal reflected a slightly larger courtyard, Segal explained that Fishman would apply to BSA for a variance to the zoning resolution’s minimum courtyard requirements for residential buildings. David West, from Goldstein Hill & West Architects, presented the revised proposal. The new plans included double-hung windows, reduced window ornamentation, and a more pronounced cornice. West described the Chambers Street facade as more formal than the “utilitarian” Reade Street facade. The Chambers Street facade would feature a more horizontal orientation with spandrels running straight across between the second and third floor. The Reade Street facade would feature French balconies with railings intended to recall the fire escapes common to the district. The Commissioners praised the revisions. Commissioner Fred Bland commended the architects for preserving the area’s vernacular context. Vice Chair Pablo Vengoechea echoed this opinion and said the project appropriately responded to the district’s existing typology. Landmarks unanimously approved the revised proposal. LPC: 87 Chambers St., Manhattan (11-5830) (April 12, 2011) (Architect: Goldstein Hill & West Architects LLP).